It seems the Brothers Winchester will be taking exit 15. 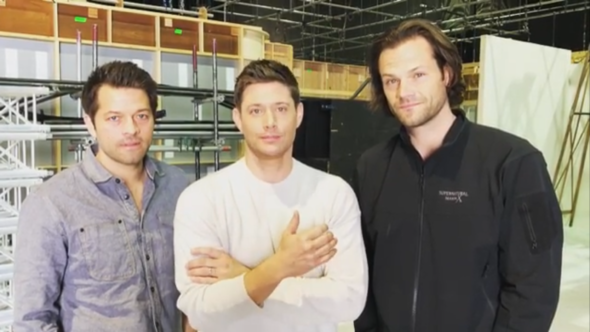 Today, Jensen Ackles, Jared Padalecki, and Misha Collins released a video confirming that the 15th season of Supernatural will also be its final outing. That’s right; it’s official. The Supernatural TV show on The CW will end with season 15. Fans who have been with it from the beginning may remember sweating out the “cancellation or renewal” question every spring in the show’s early years and marvel that we’ve come this far in a black 1967 Chevy Impala. Take a moment to take it all in, then watch the two-part announcement, below. A CW paranormal horror drama, season 14 of Supernatural stars Jared Padaldecki as Sam Winchester and Jensen Ackles as Dean Winchester (and sometimes the latest incarnation of the archangel Michael). The cast also includes Misha Collins as Castiel and Alexander Calvert as Jack. This year, guest stars include Jim Beaver, Kim Rhodes, Ruth Connell, Briana Buckmaster, Kathryn Newton, Katherine Ramdeen, Clark Blacko, Yadira Guevara-Prip, Samantha Smith, Jeffrey Dean Morgan, Amanda Tapping, Danneel Ackles, and Felicia Day. As they talked about approaching the “grande finale,” the “boys,” which was once a more apt term, all agreed to save the emotion for Supernatural‘s 15th and final season on The CW. Ackles made sure to include a tribute to creator Eric Kripke, and the Supernatural family. It’s pretty clear from their video that this was a creative decision, rather than one of network caprice. It’s also nice that they’ll get a final season to end the show on its own terms. Supernatural received an early season 15 renewal on January 15, 2019. Ackles, Padalecki, and Collins all tweeted out the video to fans, as well. #SPNFamily, indeed. The 14th season of Supernatural is averaging a 0.42 rating in the 18-49 demographic and 1.46 million viewers. Compared to season 13, that’s down by 23% and 13%, respectively. Even with that drop Supernatural is still the second highest rated scripted CW TV show. Here’s hoping that it goes out on a high point. What do you think? Are you still watching the Supernatural TV show on The CW. Is season 15 the right time to end it, or would you watch through season 16 and beyond? More about: Supernatural, Supernatural: canceled or renewed?, Supernatural: ratings, The CW TV shows: canceled or renewed? 16 , GO FOR IT! I would watch my boys forever and am sad to see them go. The only consolation I have is the reruns that I watch every single day!! Thanx for the years of pleasure and excitement you have given us all. As long as my boys want to keep going I would watch. Have a major cougar crush on Dean, I’m 64. I think most women as myself love these guys, hot, heroic with a little bad thrown it. Love them & it. Was sorry to see Crowley go, he is a handsome man and Papa Winchester. I’ve never watch the Walking Dead. I could understand a much needed break, even fake Ruby has one. I liked Jared’s wife in the part much better than the blonde. I hate to see the boys go, but I am grateful that they were given a final season, where they can go out with a bang. This final season should be one for the books.